This is a universal remote control I built. The entire thing was programmed with just 1 KB of memory, and works with TV’s using the RC 5, RC 80, and NEC protocols (most TV’s). Its effective range is about 40m, and is effective at angles up to 60 degrees. I began by using ExpressSCH to lay out a schematic of the circuit required to power the microprocessor and LEDs. 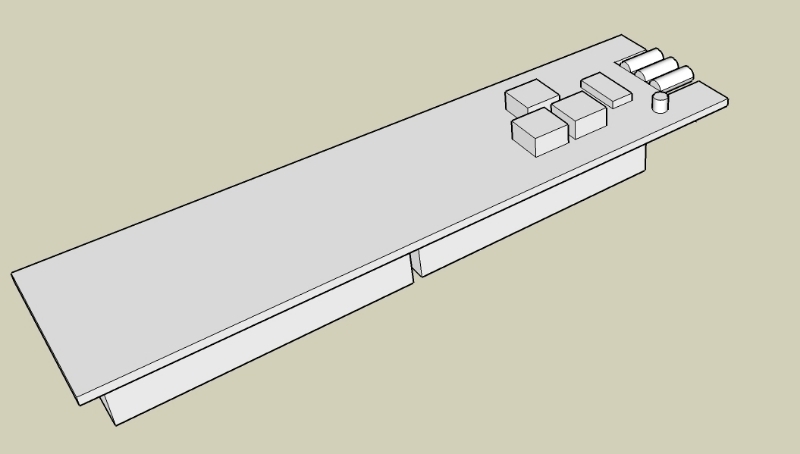 I used I then used Google SketchUp to create a mocked up 3D model of the remotes appearance. Using ExpressPCB, I then arranged the parts in a real world design that would fit the mock up. I calculated all the required values for parts, such as resistance for the resistors, and current for the LEDs, then ordered them from Digikey.com. I then used circuit board coated with photosensitive chemicals to print my circuit onto the board, through a multi-step chemical process. After cutting the board down to size, I soldered all the parts in. The process of programming and debugging required the largest majority of time. I programmed in MPLAB, and used, a multimeter, digital oscilloscope, CHRP board (see here), and MPLAB SIM to debug. Below is a gallery documenting the process of designing and building the remote. Forward and back buttons are at the bottom.